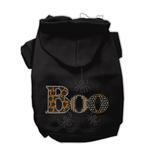 Your dog will look adorable this Halloween in the Boo Rhinestone Dog Hoodie! Boo with spiders on back. 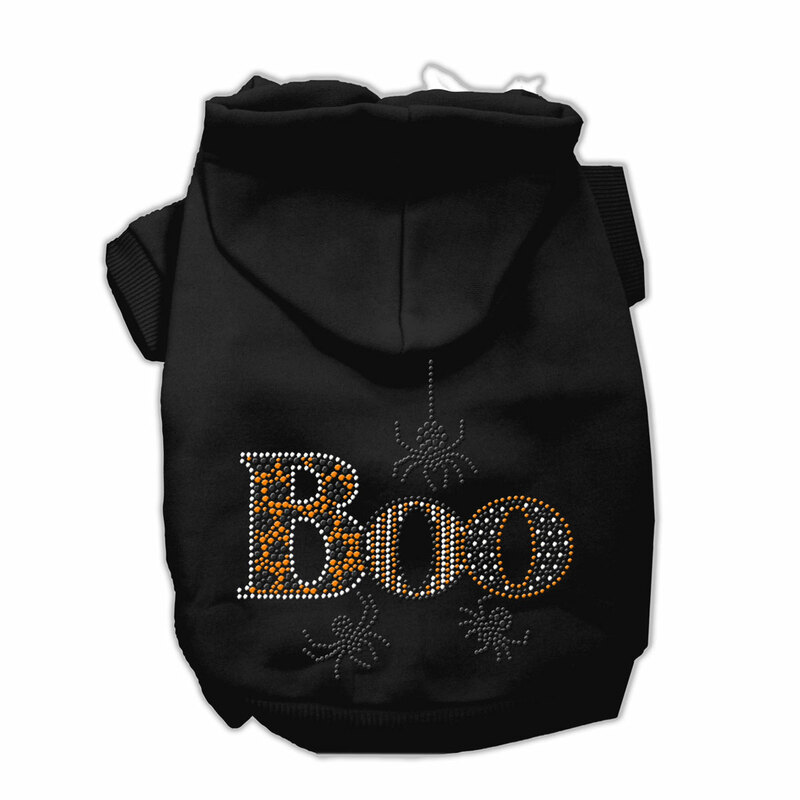 Enjoy this Halloweens trick or treating and keep your sweety bundled up with the Boo Rhinestone Dog Hoodie. Made of soft poly/cotton sleeved hoodie, double stitched in all the right places for comfort and durability. Great for holiday parties and photos! Your dog will shimmer and shine with love this Halloween! Boo Rhinestone Dog Hoodie - Black Customer Photos - Send us your photo! Puppyjack loves wearing clothes !! This is not only cute but very well made. Its is puppy size so if you're ordering for a large dog the 3xl isn't going to fit. I can't wait to put this on in October!!! I have two dogs and I'm waiting to order the white one as well! Zuzu this this is zoooper Cute! Posted On 01/15/15 by Carolyn D from Houston, TX Yes, Carolyn D recommends this product! She was allowed to wear it one day but we had to put it away for next October's Halloween month! Or maybe she'll just get to wear it whenever she wants! Love it love it! Posted On 11/06/14 by Monica G from North Jersey, NJ Yes, Monica G recommends this product! Sooo cute! I believe it runs a little smaller then the measurements listed for this item, had to use it for our smaller dog. Regardless, rhinestones make the sweatshirt stand out!